Childhood comprises the early period in the development of a person. 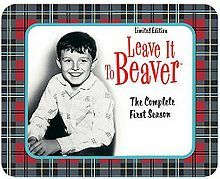 Leave It To Beaver was a popular situation comedy on American television, 1957-63. It has become an icon of stable suburban family life and moral decision-making in a world of small human foibles and no great issues. Commentators note the happy era it depicted is long gone. The plot revolved around the life of Theodore "Beaver" Cleaver, a pre-adolescent boy living in an upscale, middle-class neighborhood in the innocent years of the 1950s. In its "Golden Age," television served as a kind of social training film; sitcoms like Leave It to Beaver, Ozzie and Harriet, The Donna Reed Show and Father Knows Best were all prime-time staples that taught Americans newly arrived in the suburbs from city tenements how to act middle-class. Central to each Beaver episode was the interplay between big brother Wally and little Theodore. Their boyish attempts to navigate the social currents of school, girls, and adolescence were often tinged with frustration and loneliness. In one early episode, when Beaver is worried that his teacher will hit him over a minor mess-up, Wally corrects him: "Only the coach can hit you." June Cleaver, a typical housewife and mother, remained calm amid household tumult, providing crucial guidance to her sons while shielding them from nefarious outside influences with a matronly force of will. Her protection was frequently needed against the pernicious intrigues of Eddie Haskell. He engaged in impulsive, selfish, disruptive, and malevolent schemes, almost evil personified. For crafty Eddie, each day was one more step toward the twilight of the adults, which would herald his ascension to neighborhood ruler. The father Ward Cleaver was a Solomon-like figure of quiet dignity who dispensed parental justice tempered with understanding. Perceptive viewers knew his furrowed brow and clenched jaw were hints of serious inner turmoil, reminiscent of the anger toward society and unfulfilled economic dreams that tormented Willie Loman in "Death of a Salesman," the classic 1949 play about dysfunctional families. A comparison of how children interact with their brothers and sisters on such 1950's situation comedy television programs as 'Leave It To Beaver' and 'Father Knows Best' with those on such 1980s programs as 'The Cosby Show' and 'Family Ties' found that children interacted more positively in the early period but were important and central - if more conflictual - to the main story action in the 1980s. This page has been accessed 8,798 times.